Finally we can reveal a long-held secret that Yeoman Park Academy, who joined Diverse Academies in 2017, will be featured on television tomorrow night (Tuesday 9 October 2018) as part of the Alan Titchmarsh programme, ‘Love your Home and Garden’. Staff member Benita Wood was successfully nominated by a family friend to take part in the programme because of her support for son Josh, who is also a student at the academy and has complex needs, together with her tireless work in supporting the students at Yeoman Park. The programme follows the renovation of Benita and Josh’s house, with home improvements taking place throughout the downstairs including completely revamping the kitchen and living areas of the property – this has had a significant impact as it now means that Benita can see Josh whenever she is in the kitchen, and support him better as a result. Equally as important, the work completed by the Love your Home and Garden team provided access from the downstairs of the property outside to the garden. Prior to the renovation, it was a struggle for Josh to get into this outdoor space, but this summer he was able to have friends round to the house and out in the sunshine for his 16th birthday – something that could never have happened without this work taking place. Benita says of their involvement: “The whole experience has been really positive, and has changed our lives. 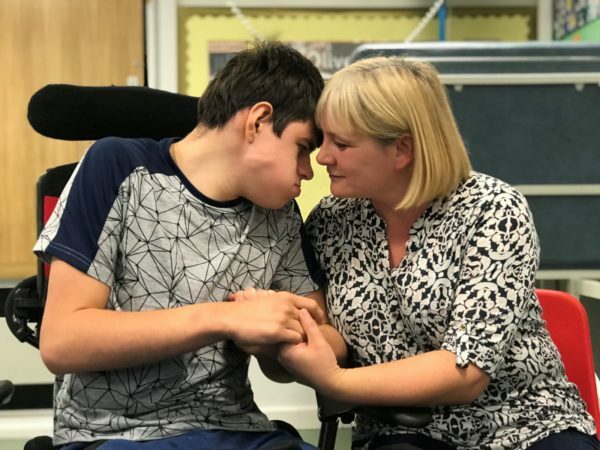 The work undertaken by the team has made a huge improvement to Josh’s quality of life, and made things much more stress-free and happy at home. As Josh and his chair have grown it has been years since being able to get out of the back of the house, but we now have easy access and are enjoying spending time in the garden together. After being surprised by Alan Titchmarsh at the academy in January 2018, the work on the house started in February 2018 and was completed in April, giving the family the chance to enjoy this glorious summer in the garden. The programme is aired at 8pm on ITV1, titled Love Your Home and Garden.